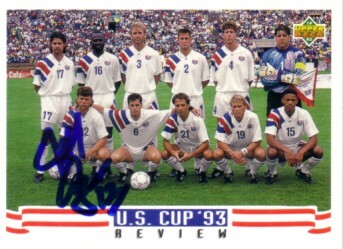 US Soccer 1993 Upper Deck card featuring the starting 11 players at the 1993 U.S. Cup Final, autographed in blue marker by Jeff Agoos. With certificate of authenticity from AutographsForSale.com. ONLY ONE AVAILABLE FOR SALE.